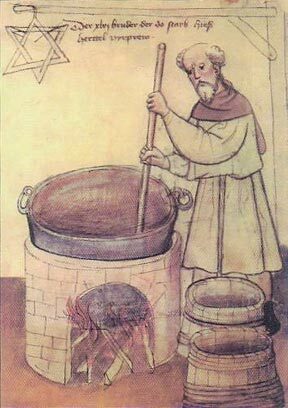 The 6 pointed Brewer’s star’s, identical to the Jewish Star of David, actually has its roots in alchemy. Enclosed below is a diagram by Hans Kestler, former Huber Brewery brewmaster, illustrating the component parts of the brewers star, as related to brewing and alchemy. These elements include Fire, the masculine element of action and determination, portrayed by a triangle facing the heavens. The masculine element of air which deals with communication and intelligence is also a triangle, facing upward, but with a horizontal line symbolizing the clouds at the top of the mountain. These two elements are ascending and are governed by the principal of levity. The feminine element of water is represented by a triangle facing the earth - like the rivers that flow to the lowest grounds. Earth is the other feminine element that is represented by a triangle pointing down with a horizontal line representing the surface of the earth. These two elements are ruled by the principal of gravity. Combined these four elements represent the Great Work in alchemy, which means harmony balance and peace. These noble concepts are represented by David's Star. Just like the yin-yang symbol of Eastern Alchemy represent the balance between feminine and masculine, so does the Shield of David symbolize the peace between any two opposing forces. The fact that the planets would align in this formation shows that we are headed to a time of great transformation that would eventually lead to harmony balance and protection. In alchemy, the two triangles represent the reconciliation of the opposites of fire and water. 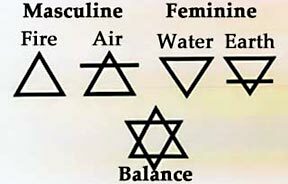 Non-Jewish Kabbalah (also called Christian or Hermetic Kabbalah) interprets the hexagram to mean the divine union of male and female energy, where the male is represented by the upper triangle (referred to as the "blade") and the female by the lower one (referred to as the "chalice"). Moreover, it derives four triangular symbols from it (two triangles crossed like a capital letter A and two uncrossed) to represent the four elements: water, fire, air, and earth. This use of the symbol was used as an important plot point in Dan Brown's popular novel The Da Vinci Code and the Da Vinci Code film citing this as the origin of the star. The Six Point Star, can be drawn two different ways, as an upside-down triangle overlapping an upright triangle or as one continuous line that angles to create six points (credited to Aleister Crowley). In the first example, when used in alchemy, the upright triangle represents fire, the upside-down triangle is the symbol for water and together they symbolize the unity of opposites. Although the pentagram is widely recognized as the symbol of witchcraft, the hexagram is actually very ancient and one of the most powerful symbols used in occultism and the casting of zodiacal horoscopes by astrologers. In fact, magicians and alchemists believed that the hexagram was actually the footprint of a demon called a “trud”, which they used in ceremonies to both attract and repel demons. The word “hex” or “curse” comes from the hexagon. 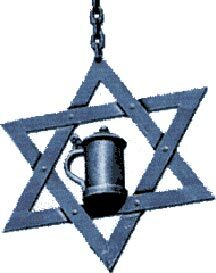 The hexagram, in addition to appearing in the Great Seal of Solomon, is also a common symbol in Judaism, as there supposedly was a 6-pointed star on the shield that David carried to battle Goliath. However, despite the popularity of the Star of David, there is no Biblical or historical evidence that connects the hexagram with King David of Israel, although it can be traced to King Solomon when he turned to pagan gods in his later years. In addition, on the website “White Beer Travels,” the article speaks about the Zoigl Star, used extensively in the communal breweries of the twin villages of Windischeschenbach (www.windischeschenbach.de) as well as Neuhaus an der Waldnaab (Neuhaus bei Windischeschenbach), Mitterteich, Falkenberg and Eslarn – as stated on the "official" Zoigl website, Zoigl-Heimat (Zoigl Homeland), www.zoigl.de, (in English. www.zoiglschanktermine.info.ms These towns are situated in an area called the Oberpfalz (Upper Palatinate) (www.oberpfalz.de), which is in the NE part of Bavaria, in Germany (Deutschland), close to the border with the Plzenský kraj (Pilsen Region) of the Czech Republic. Zoiglbier is essentially an effervescent form of a Bavarian Kellerbier, but brewed from more highly kilned malt, which gives the beer a slightly darker, deep amber, color. It is also less hop-accented. Its alcohol content by volume is usually below 5%. The Zoigl Star is, again, the 6 pointed “Brewers Star.” Again, as in Hans Kestler’s article and illustration, one triangle of the Zoigl symbolized the three "elements" involved in brewing: fire, water and air; the other triangle symbolized the three "ingredients" used in brewing: malt, hops and water. When posted outside of the communal brewery, it signified that the Zoigl beer was ready to be purchased and consumed.